If you are interested in studying meditation or going on a meditation retreat while you are in Kathmandu the Kopan monastery offers various options. The most popular is the ten day course. Regular 10 day introductory courses are held in March, April, May, June, September and October. The courses give an introduction to Tibetan Buddhism, teach meditation skills and include a two day analytical and single pointed meditation retreat. The courses are led by Western sangha, with daily teachings from a Tibetan Lama. If you are just interested in Buddhism, or experience problems in your life such as uncontrolled emotions, dissatisfaction, etc - this course will give you some skills to address these problems and make your life more fulfilling and meaningful. The daily schedule starts at 6.30 am and finishes at 9 pm. 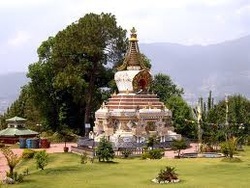 It encompasses sessions of meditation, teachings and discussion groups. 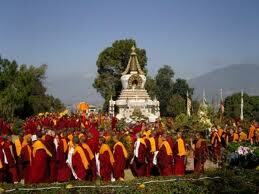 The course leader as well as the Tibetan Lamas of the monastery is available for personal guidance. The daily schedule. The participants are expected to attend all session. Half day silence is kept as a course discipline. Just north of the ancient Buddhist town of Boudhanath is the Kopan hill, rising up out of the terraced fields of the Kathmandu valley and visible for miles. Dominated by a magnificent Bodhi tree, it was once the home of the astrologer to the king of Nepal. It was to this hill that these lamas came with their first Western students in 1969. Kopan Monastery had its beginnings in the Solu-khumbu region of the Himalayan mountains. In 1971 Lama Zopa Rinpoche, the reincarnation of the Lawudo Lama, a yogi of the tiny hamlet of Lawudo, fulfilled the promise of the previous Lawudo Lama to start a monastic school for the local children. The school was called called it Mount Everest Center. Twenty five monks moved down from the mountain to Kopan in 1971 - prompted by the harsh climate at an altitude of 4000 am, which made study barely possible in winter. Now Kopan is a thriving monastery of 360 monks, mainly from Nepal and Tibet, and a spiritual oasis for hundreds of visitors yearly from around the world. Nearby is Khachoe Ghakyil Ling Nunnery, home to 380 nuns. Both the monastery and the nunnery are under the spiritual guidance of Lama Zopa Rinpoche, and the care of the abbot, Khen Rinpoche Geshe Lhundrup Rigsel. And it is the wellspring of the FPMT, a network of some 140 centers and activities world-wide, themselves expressions of the Buddha activity of Lama Thubten Yeshe and Lama Zopa Rinpoche.